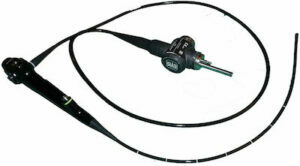 Endoscopes are medical applications of macro imaging. The challenge in testing endoscopes is finding a test chart that is precise enough to have a minimal effect on the measurements and large enough to cover the field of view. Conventional inkjet targets are too coarse to for endoscope measurements. The transmissive Micro Multi-slide chrome on glass test chart can be used to map the resolution of endoscope cameras over the entire image surface, and also to measure optical distortion and chromatic aberration. Because the chart has only a single tone (no gray scale or color patches) it is not suitable for testing tone or color. 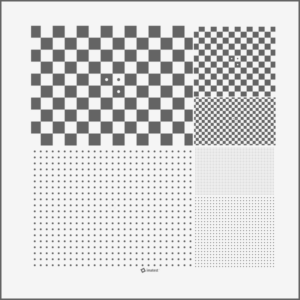 The images acquired from this chart can be automatically analyzed by the Checkerboard and Dot Pattern modules. If only a small set of edges can be obtained it is possible to use basic SFR sharpness analysis after manually selecting test regions, but this will not produce information about distortion or field of view. We can also provide custom chrome on glass charts up to 4×4 inches (100x100mm) on request. Previously we recommended the SFRplus chrome on glass test chart which has strict framing requirements that make it a less ideal solution than the checkerboard pattern. Most endoscopes include built-in light sources which may be difficult to disable . In order to test with the onboard light source enabled, a reflective chart are necessary. The Rez Checker chart includes precision color and tone patches along with the sharpest edge and hyperbolic wedge features that are available on reflective media. 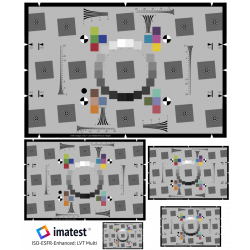 The color and tone patches can be measured by Multicharts (interactive) or Multitest (fixed) modules. The resolution test areas can be measured by the SFR and Wedge modules. 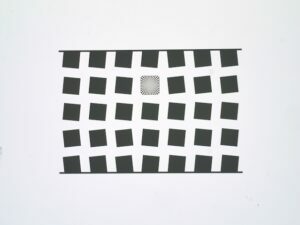 If the endoscope field of view is large enough (over about 2×2 inches) a photographic film chart (much finer than inkjet but not as fine as chrome on glass) may be a good choice. We have multi-size SFRplus and eSFR ISO charts, and we can create custom charts on 8×10 film that combine several chart elements (SFRplus and/or eSFR ISO without or with pre-distortion for fisheye lenses, the 36-patch dynamic range chart, or completely custom designs).